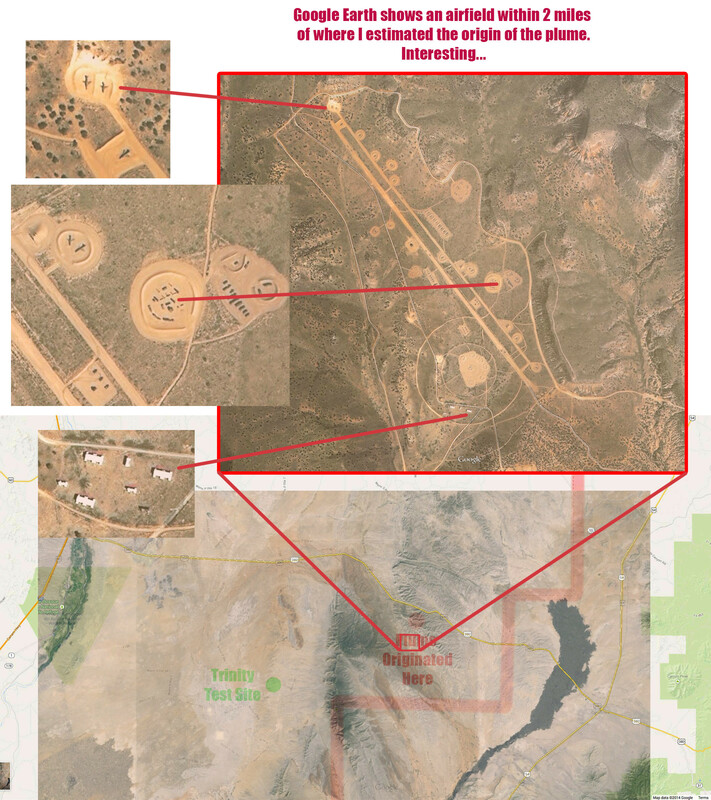 Mystery plume radar image near Nuclear Test Site – solved | Watts Up With That? I’ve seen images like this dozens of times before. It is very likely a large swarm of birds taking off. The first two frames are the giveaway. When birds take off from the ground, they are tightly packed from their feeding/roosting area. When they go aloft, they immediately spread out, and that is exactly what we see in the first two frames of the animation. Compare it to Figure 2 in the article below and the animation below and you’ll see what I mean. A similar dramatic roost ring was documented on August 10, 2006. And there was a similar event during the Oklahoma Earthquake in Nov 2011. Our sensitive NEXRAD WSR-88D Doppler Weather Radar network is routinely capable of picking up bird swarms like this, something we couldn’t see with older WSR-57 and WSR-74 weather radars. The NEXRAD system can also pick up bugs and bats that exhibit typical swarm behavior. We’ve all seen huge swarms of birds that blot out the sky, so of course they can be picked up by weather radar looking for rain, since birds, like humans, are mostly made up of water. A vast swarm of bugs that covered much of the northern half of the North Island last night and this morning has been caught on the Metservice weather radar. MetService didn’t know what it was and entomologists were puzzled. Doppler radar transmits pulses of energy into the atmosphere, and when this energy intersects a target, information about the density (radar reflectivity) and motion (radar velocity) of the target is transmitted back to the radar (Figure 1). Most of the time the Doppler radar beam intersects targets composed of water vapor, including clouds, rain drops and hail stones. Meteorologists utilize this data from the radar to interrogate storms, which makes the Doppler radar a critical component of the proactive severe weather warning service that the National Weather Service (NWS) provides. Sometimes, the radar beam intersects other objects, including birds. When there is a high density of birds in one location, typically during bird migrations, sometimes as the birds take flight the radar beam intersects the flock. This happened in several locations across coastal Southeast Georgia on the morning of October 25, 2009, right around sunrise. This is a favored time for birds, particularly waterfowl, to leave their nocturnal nesting sites on bodies of water to either continue their migration or return to their favorite daytime refuges. The animation (Figure 2) illustrates two large and one smaller area of birds taking off, as detected by the NWS Jacksonville Doppler radar. In addition, there is a Google Map (from Google Earth) to reference for location (Figure 3). It appears as though the southernmost flock arose from the Satilla River near Woodbine, while the other flock ascended from a tributary of Buttermilk Sound, just west of Little St. Simons Island. A third, but smaller flock, appears to have flown from the western side of Cumberland Island National Seashore. Many bird enthusiasts utilize radar imagery to track migration patterns. Radar imagery has also been helpful to both birds and humans regarding aviation safety. Most airport terminals use radar data to track birds as they cross flight paths to avoid collisions. Click here for more information on the NWS Doppler Radar. The playas at 34.655294° -105.900141° might be good candidates for a starting point, since they are probably wettest around this time of year. Note the line of bird choppers to the south. Starting with the radar image (composite of all altitudes) at 7:49 PM Saturday night, we see a lot of ground-clutter returns (the lower radar beams hitting the surface mainly). About an hour later (9:09 PM) and after sunset, things have really changed. Lots of echoes and some very intense. These are the birds. Birds don’t like to migrate offshore very far and you can see that in the echoes. 5:37 AM there are still some birds, but the numbers are dropping. The Langley radar is a Doppler radar and it gives the velocity of the targets (in this case birds) towards or away from the radar. Here is the Doppler image at 12:46 AM. Green indicates approaching and red and orange going away. Clearly the birds are heading south! Now let me show you something interesting. Here in Seattle we have a very special type of weather radar, called a radar-wind profiler, located at the NOAA facility at Sand Point. Instead of sweeping horizontallly, this radar has three static beams, mostly facing upwards. This radar picks up birds as well. Take a look at an image from this radar for the 24-h ending mid-day Sunday. The y-axis is height in meters and time is on the x-axis (in Greenwich Mean Time (GMT, UTC), 06 is 11 PM, 12 is 5 AM, etc.). Stronger returns are in purple, blue, and green. The birds are obvious. Around 03 UTC (8 PM) we we see the start of the bird echoes. Lots of flying in the evening, which fades a bit in the middle of the night. But you see a complete collapse after 5-6 AM as it starts getting light out. or is it a missing 777 ???? Prior to the invention of radar, this sort of thing (i.e. large radar echos of flapping monster of death) never happened. We can conclude that radar causes flocks of birds. The radar time is around 0200Z. Minus 6 hours would make it 8pm local and an hour after local sunset. A better guess would be a surface explosion, as in WSMR weapons test, lofted a reflective dust plume into a strong west wind. A search of meteorological wind records and plotting a better origin pt coordinates could confirm or refute this hypothesis. 1. Birds like to fly at night when there is less turbulence and thermal gradients to contend with. 2. Explosion plumes expand and dissipate, this one gets tighter near the end. I don’t know, it’s suspiciously close to Roswell. I live across a major road from a farmer’s field with a large pond frequented by large flocks of Canada geese. Their takeoff patterns are fascinating, and they don’t stop their movements at local sundown. I will now look to see their own “first two frames” leading to their customary recursive chevrons. The Ivanpah plant, in San Bernardino, uses 173,500 mirrors to reflect sunlight on to boilers, but despite its green credentials it has been criticized as a flying hazard. ‘In my opinion the reflection from these mirrors was a hazard to flight because for a brief time I could not scan the sky in that direction to look for other aircraft,’ the pilot added. Anthony, I wonder if the bird swarm hypothesis is workable in this instance. I judge the plume in the radar still to have an east-west length of approximately 40 miles. Considering the barren landscape west of Tucumcari, such a large and dense flock seems unlikely. Chaff released in combat aircraft defense system very much tends to be very punctuate in appearance. For that to be a chaff cloud, many hundreds of pounds would have to be released, possible as tactical and USAF special ops aircraft frequently use the range. Still a weapons test or a static rocket motor test could launch a large dust cloud, and if an Al-powder based explosive/propellant was used it might have good reflectivity to look like chaff. I hate to say it, but I think birds is an unlikely explanation. Shortly after the loop begins, the echo almost fills De Baca county, which is 2334 square miles in area. This would be an extraordinarily large flock of birds! Unfortunately, I don’t have another explanation. Second, the sub-committee, after ‘consulting broadly’, appointed a panel to workshop the questions and then provide input to the new official statement on climate. The appointed panel of six, amazingly, includes three eminent sceptic scientists: Richard Lindzen, John Christy, and Judith Curry. The other three members comprise long-time IPCC stalwart Ben Santer (who, in 1996, drafted, in suspicious circumstances, the original IPCC mantra about a “discernible” influence of manmade CO2 on climate), an IPCC lead author and modeler William Collins, and atmospheric physicist Isaac Held. Given the length of the animation (about 1.5 hrs) and distance traveled by the leading edge, it works out to about 60mph. I’m guessing that they were assisted by a tailwind, and perhaps even decided to move because of that. The other interesting this is that judging by the amount of De Baca county (about midpoint of the track) covered by the signal, the size was approaching 1500 sq mi. I’m wondering how much of that was really artifact, because the movement and changes in shape look pretty natural. they were probably scared out of their trees by that nuclear warhead being detonated! A large flock of starlings in coordinated flight? Obviously, it’s a plume of missing heat trying to find its way into the ocean deep. Probably got lost when it took a left turn at Albuquerque. There are actually two possibilities if this is about living critters. There are a large number of birds at the Bosque del Apache reserve just south of Socorro but they tend to be nesting by just after sunset. There are 100,000s of mostly migratory waterbirds there. The other possibility is bats (and possibly insects that they might be chasing). There are two colonies of bats living in lava tubes just about 15 miles west of the Trinity site. Each colony is made up of about a million individuals and just before sundown they are an incredible sight to see as they depart their caves for a night of feeding. They leave in to two separate flights with each flight blackening the sky for about 30 minutes each. My bet is on at least a portion of the 2 million bats. These are not the bats at Carlsbad Caverns. Those are south of this area and I think there are fewer in that colony. As Alan Bates has mentioned above large ‘swarms’ of starlings, which are quite common in various parts of Britain are known as: a murmuration of starlings. They are fascinating to watch too! Do birds exhale CO2 on takeoff? Why else would the latest political derived radar register such an event? are the tubes small enough so they pour out in a really defined shape? never seen pics of stuff like that, bet it would look cool. I have seen movies of a murmuration of starlings and there are starling sightings in New Mexico but I don’t think there are the large numbers of starlings found here compared to the UK. They certainly are not native to NM. The bat flights are quite fascinating to watch also but I would love to see a live murmuration of starlings! would these be Jornada Bat Caves? Not radar but amazing all the same – starling murmurations. I see that the range rings indicate that the ‘flock’ was around 100 miles away from the radar center. This indicates the ‘flock’ were traveling at a great height, not just taking off. The tubes are below ground level and are collapsed in several places. There is an extinct volcano several miles north of the bat site. So there are probably many miles of underground tubes in the area. It looks to me that the two colonies occupy adjoining tubes. The north colony tube opens to the south in a collapsed open area about 200-300 meters wide. The north colony underground portion of the tube may be a half of a km long. The south colony underground tube goes south from the big opening. The tubes are big – maybe 8 or 10 stories tall (deep). It seems like there are 10,000s of bats a minute swirling out of the tube openings. Wow! They circle into the sky and on the evening that I watched they seem to fill the sky in every direction and climbed higher until I could no longer see that part of the flight. Of course, as I noted earlier, they just kept pouring out of the mouth for about 30 minutes. The first flight became kind of a trickle,and then the next flight of the other colony started and that lasted for another 30 minutes. They seemed, on that evening anyway, to head off in different directions but I have no idea if that is common. And with so many bats there is a good chance that the radar only picked up a portion of the colonies. More than cool mind boggling to say the least! The real question is how many of those birds got pulverized in wind turbines. Starlings are not native to North America. They are an invasive weed species here which should be eradicated, as they drive out native species. A Shakespeare lover released starlings in NYC’s Central Park in 1890 & 1891 because he wanted America to enjoy all the birds mentioned in the Bard’s works. Within a decade the aggressive species had spread clear across the continent. Yes it is the remains of the Jornada del Muerto Volcano. Go to Google Earth and find New Mexico. The volcano is at 32 deg 32 min 1.29 sec N and 106 deg 52 min 0.66 sec W. You can actually see a whole series of collapsed lava tubes to the south and south west of the cone. The bat caves are in that sw series of tubes. This is private land so there is no open access. We had permission to be there that one evening that I got to see this neat event. It apparently happens every evening like clockwork. Regardless whether the radars paint them, the birds are coming north in force, right now. They know bugs are gonna start emerging from their over-winter lairs. Now I’ve surmised,…. birds (some/all) “see” in ultraviolet light. Why else would they have fluorescent plumage. IIRC, humans did not realize how much birds fly at night until radar became common in NW Europe during The Big One. If there’s a definitive book on the European Theater night fighter war, it’s Alfred Price’s “Instruments of Darkness”. He’s a postwar RAF electronic warfare specialist who does well in balancing technical & operational aspects of the horrific night skies over WWII Germany. IIRC the Nachtjagdwaffe claimed 7000 mostly British bombers & probably actually got most of them, unlike inflated day fighter claims. When the local greens get their windmills, they can cut that down to one million bats. BTW, I’m one of the center left, conservationists, who is a lukewarmer and who follows this and many other climate blogs! Some local knowledge: The beginning is quite a ways north of the WSMR, probably 60 miles. There is a lot of Air Force training in that area, both US and German AF, and they like to train at night, so chaff is a possibility. The beginning is also 100 miles east of the Bosce Del Apache on the Rio Grand, which lessens the likelihood of birds. But bats are a possibility. that position is the north end of the lava field. I wondered about this. It happens with Mexican Freetail bat colonies in central Texas throughout spring and summer. We love our bats! Of some note, when and where did the dust storm that hit Lubbock Texas Tuesday nite start up? I have witnessed a flock of Redwing Black birds leaving their roost site on Morning, it took over three hours for the flock to finish passing over. I was on that field goose hunting in north western Minnesota when I was still a youth. In north Dakota the flocks of snow geese look like clouds in the distance. they often travel over twenty miles from their roost site to where they feed, some time that was a determinant for us goose hunters in North Western North Dakota since often they would end up in Canada. Birds are so cool! Its actually a more interesting explanation, if you like birds. I’m prone to thinking this was smoke, originating back in NM from a short-duration T-storm initiated fire. With the proper meteorological conditions, the smoke could have been capped from going above say 5 or 6,000 feet and it would normally be seen to diminish as it becomes either dilute or descends and precipitates back to earth (have seen this due to fires in Mexico before; literally we had ash coming down here in North central Tejas). In regards to the apparent speed with which some of the flocks seem to expand; could it be that rather than the speed of actual birds, we are seeing the speed at which other birds sense the other birds leaving, and then they take off and enter the vision of the radar? So, the radar is showing the expansion of the flock taking off from the ground. Given the length of the animation (about 1.5 hrs) and distance traveled by the leading edge, it works out to about 60mph. Looks like things really got going north of Lubbock about 2:30 CDT in the afternoon. Isn’t this interesting … same phenom seen tonight coming from the area north of the HDX White Sands RADAR site beginning at 2359z (about 7PM CDT) 19Mar2014. Interesting … bats coming out of cave(s) maybe? Nothing of note on the LWIR sat image, nothing on visible up until dusk either. Call me a skeptic (again). Don’t buy the bird or bat explanation… too large too fast. 18 / 1900 MST – 2300 MST (0200Z – 0500Z) blowing dust & low clouds (1500′ to 3000′) rolling through. w/probably virga showers. “Occam’s Razor – the simplest explanation is most likely” … but not necessarily the correct one. Occam’s Razor as an argument of proof of one theory over another is about as Anti-Science as it gets. Here in south-central Arizona, we often see large strong (30-50dBZ) areas of echo caused by military chaff from the military practice ranges in the western part of the state. Dr. Robert Maddox, former head of NSSL, studied these an tentatively concluded that as the chaff drifts eastward, it inhibits lightning in thunderstorms. At his talk, he showed a day when there were many severe thunderstorms across the area (common here in monsoon season). A significant area of them had zero lightning – per the lightning detection networks. The only plausible cause was the chaff, by mechanisms unknown. This was around a decade or more ago – I don’t know what has happened since the,. A thermal collapsing after nightfall, kicking up dust? Not bats–they return to the caves after overnight feeding. They certainly don’t fly hundreds of miles away. Since it appears to have gone as far as Lubbock, I agree with _Jim. Must have been a dust storm or perhaps smoke from a fire (or a combination). Does dust or smoke give off that kind of echo by itself? Hmm… I would have thought that if they were bats or birds the swarming would be a regular (daily?) occurrence and thereby a well known and unsurprising event. Even migrating birds would at least be a seasonally well known event, surely? So why then the surprise? Seems like an indication that it is something totally different. Any thoughts on this aspect? Good explanation, I agree with you Anthony. thanks, I looked at some photos and it really looks pretty cool. that gets SUPER cool around 2 min mark. I think Occam’s Razor might also determine that if it was a secret military test, we aint going to be told what is was. Or it could be a natural phenomenon, closer examinations and comparisons of the Radar Cross Section frequencies from both the meteorological and military radars that recorded this event and the rate of progress/speed of the cloud combined with wind speed recorded at the time might give some more clues but if it was a secret test then the military are not going to part with classified data. The initial propagation and dispersal data should also be looked at in closer detail. Were there any eyewitness accounts from along the route? At what height did the cloud travel and how deep was it? I doubt a very large chaff cloud would have endured as long as this event but a aerosol carrying medium may very well. I’ve been to a NWS facility in Norman, Ok, and they have similar pictures on the wall there, I think they had bat’s, bird’s, and insect’s radar returns. …I doubt a very large chaff cloud would have endured as long as this event but a aerosol carrying medium may very well. Chaff, bats, birds, insects, smoke plume ‘capped’ by unusual atmospheric vertical stack-up or composition (we have had ‘smoke’ and ash reign down on us near Dallas fro fires in old Mexico for instance) or a combo of the foregoing perhaps. Oh, I think they had a car in a tornado as well! Hmmm … one should go back to the 16th and 17th and check the HDX and FDX WSR-88D RADARs to check to see if this phenom was recorded then, too. This area is just east of where I am now. Certainly no standing water in that area, it hasn’t really rained here (> 0.1 inch anyway) since last year. Closest water (and birds) would be the Bosque Del Apache area on the RIo Grande. Recent high winds would produce large dust clouds and there has been some fires (10,000 acres or so). OCORRO COUNTY, N.M. —There is speculation surrounding a radar blip that occurred east of Socorro Wednesday. Some weather experts believe it was some sort of test involving chaff, a reflective material dropped from aircrafts — usually military aircraft — to fool heat-seeking missiles. Most agree it was a single event, and that the event occurred near a point along Highway 380 in southeast Socorro County. The blip occurred southeast of the city of Socorro and just northwest of the town of Carrizozo. It was within the White Sands Missile Range. 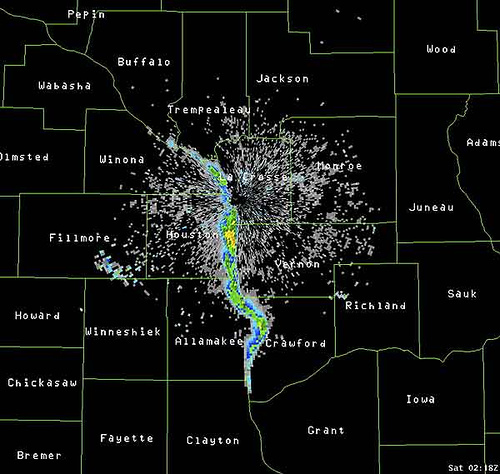 Winds from the southwest quickly diffused the plume (as seen by radar in the image above). On Wednesday evening Socorro County officials weren’t aware of any fires in the area. Other experts believe it was not an explosion or fireball, and if it was it was a significantly low-level explosion. Again, most believed it to be some sort of chaff experiment. Oops, the just-above news bit should be SOCORRO COUNTY, N.M. and not OCORRO. In the animation, the plume begins about 0130Z at roughly the latitude of Las Vegas, which is UTC -8, or 1730PST. Sunset at Las Vegas is 1750PST on March 17th (from USNO chart). Wouldn’t that mean the plume started right around sunset, or is my timing off? Here is a good video of a starling murmeration. I had something like this go through our neighborhood a couple years ago, never seen anything like it before (or sense), so many birds and so noisy! Please stop producing logical explanations for what occurs here in New Mexico. We need all the whacked-out UFO tourists we can get. One good spooky “I don’t know, but it could be-” from you could produce tens of millions for local economies. Anyone see the movie Pitch Black? Reason for change: Previous RADAR loop time was relative to the or a *present* point in time, vs being specified as an absolute time, so the desired loop imagery was not being displayed. These ‘loops’ will be non-operative in a few days anyway, as the UCAR.edu website purges files over 5 or 6 days old. I have no idea whether the radar loop in question is caused by bats, but we can see the bat emergences from a number of colonies in central and southeast texas on doplar weather radar almost every night. There are several urban colonies in bridges (i.e. Congress Avenue in Austin, Waugh Drive in Houston, and McNeil Bridge in Round Rock) that are clearly visible nearly every night, despite the ground clutter in the area. In a wide open area like New Mexico, a half million or more bats would make a very strong echo on radar, and they have been documented flying up to several hundred miles in a single night in pursuit of insects. One project in the area southwest of San Antonio was able to track bats flying at low altitude for well over a hundred miles south after emerging, then rising up to ~10,000 feet to feed on moths being carried in from Mexico on winds blowing northward. The bats were riding back towards their roost while feeding, and did not return to the roost until just before sunup. We see similar behavior in emergences in the Houston area, where the bats at Waugh Drive nearly always fly directly upwind initially upon leaving the bridge. Generally, you would expect the bats to disperse as they leave the colony on radar, but if they are travelling towards the radar site, as the radar clip in question shows, the returns would increase as due to the decreasing distance, and could appear to strengthen, even as the bats disperse with time. That is true of any of the explanations for the radar loop in question. The apparent increase in strength of the signal as it approaches Clovis may simply be a function of decreasing distance from the radar. The only situation where I would expect bats to stay more concentrated would be if they were tracking a swarm of insects that had just hatched from playas or wetlands nearby that was being blown to the east by the wind. The maternity season for central Texas bats appears to be timed to coincide with the migration of corn earworm/cotton bollworm moths from Mexico, so it is conceivable that bats in New Mexico could be tuned into similar insect hatches and movements there as well. If the same radar echoes are coming from the same locations multiple nights in a row with varying intensity just after sundown, bats would make a pretty reasonable explanation. Another interesting bat/military radar situation was Bracken Cave’s impact on operations at Randolph Air Force Base outside of San Antonio. Bracken Cave has somewhere between 20 and 30 million bats during the summer and is located on the flightline into Bracken. At one point in the distant past the military contemplated dynamiting the cave shut to eliminate the issue of the bats interfering with the radar, but thankfully cooler heads prevailed and they now [tailor] their flight operations to avoid the nightly bat emergences. I am sure that this has nothing to do with the Trinity test site where the atom bomb was detonated at White Sands Missile Range. I was EOD at WSMR in the 80s and know the area well. This is northeast of Ruidoso. That a few hours drive away from WSMR. Ruidoso is up in in the mountains. We used to go skiing there. Further to the east from Ruidoso is another flat land. Basically if this was from WSMR it would have to go up and over a mountain range. It’s ghosts. Ghosts of all the people killed by nuclear radiation. Or a flock of birds. If you look at NOAA image for that day it was a HaBoob that started at the Seria Blanca’s and blew east towards Texas, it was huge winds blowing up dust. Check the Correlation Coefficient. CC was in the range of 0.4 to 0.45 and winds were from the west at ~ 20 kt. at ~5,000 ft. I thought birds typically produced a CC value higher than that but I could be wrong. Meant to add the low Correlation Coefficient seems more in the range expected for chaff than for birds. Chaff released by light artillery perhaps? A flock of birds covering over 3000 square miles and reaching peak speeds of 84 knots? Maybe with a 50 knot tailwind. New Mexico, the Land of Enchantment & (Space) Aliens is indeed special. Its governor Susana Martinez has taken a lot of flack for her policies on human aliens. She has guts & I hope she runs for president. Might I suggest you check a couple of my posts above on this subject? Bosque Del Apache National Wildlife Refuge is a likely source of birds. The plume looked like it originated from the west slope of North Oscure Peak. The plume actually lofted before sunset and continued travelling east. The speed and direction of the targets indicates that they were at high altitude (winds aloft were WSW and fast, winds at the surface were light southerly). I’m thinking large bodied (very radar reflective) birds lofting on an evening thermal. If you track the “plume” across Texas toward Oklahoma you’ll see the “sunset spike” on the base reflectivity loop followed by blooms of clutter consistent with spring nocturnal bird migration (relative velocity puts low altitude targets on a northerly heading at about 20). 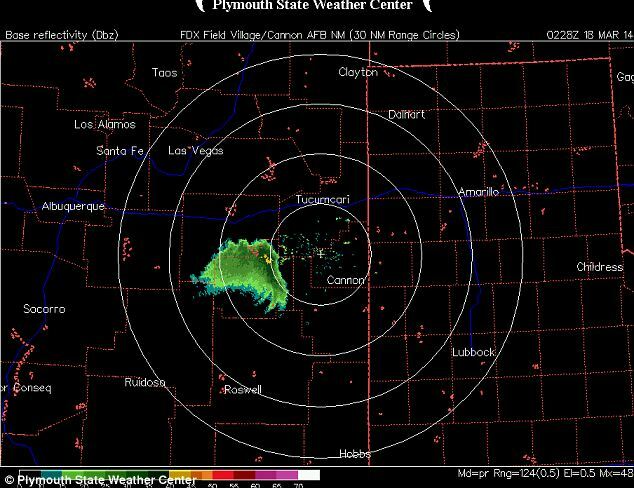 The “plume” from New Mexico travels across Amarillo and then drops out near the OK TX border. Here are some pictures overlaid on a newscast (below) that try to pinpoint where the anomaly originated. My first guess when seeing that the plume originated at or very near North Oscura Peak was that it was a high altitude chaff deployment having to do with testing their ability to track and target missiles. I live in Las Vegas NM and travel to work in Santa Rosa, NM an hour away. That morning there was a fog like substance through out both cities. I found it strange that by the afternoon the substance was still in the air. That’s when I assumed it was dust but there was no wind that day.